“Season of the Dead Hours” is Merk’s third graphic novel and his first completely solo book that delves into Celtic myth and magic, as old world sorcery returns to present day. 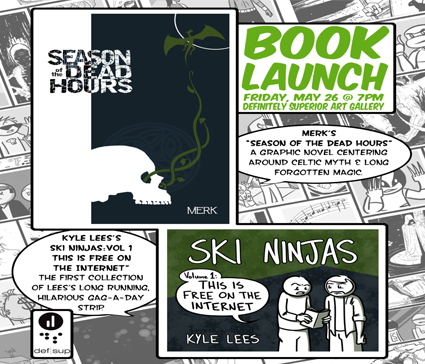 “Ski Ninjas-Vol 1: This is Free on the Internet” is the first collection of Kyle Lees’ gag-a-day online comic strip that ran from 2006-2017. Maclean’s named it among the top 5 university comics in 2012.